I've been doing lots of yarn crafts recently, using up lots of the odd bits left over from larger projects. My craft room seems cold at this time of year even with the heating on. So I've been sitting in the living room with watching telly and working with lovely warm, brightly colored yarns. 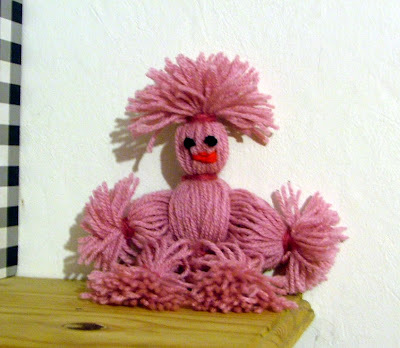 Making this yarn doll took me right back to being a kid again. We made loads of these, sorting through my Mum's scrap wool bags. My own kids used to make them when they were small too. My daughter remembered them as soon as she saw this one.